Terri was born on December 3, 1963 and on March 31, 2005, Terri Schiavo died after being deliberately dehydrated, with the consent of the courts. Fr. Frank Pavone of Priests for Life was at her side and presented the truth about her death, and about the value of her life, to the national and international media. Priests for Life, along with Terri’s family foundation (www.TerrisFight.org) have declared March 31 to be “Terri’s Day” and have prepared various materials to help individuals, families, and parishes remember her (see www.TerrisDay.org). 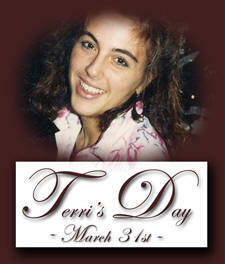 Lord, thank you for the life of Terri Schindler-Schiavo. and the truth that life is always sacred.